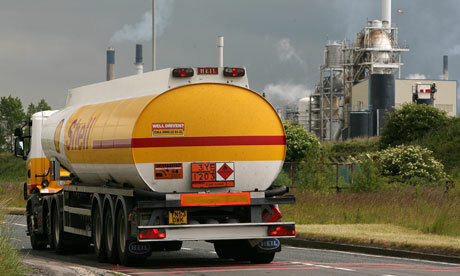 This week, tanker drivers in the UK have voted in favour of strike action over health and safety concerns. The 2,000 drivers balloted are responsible for around 90% of the fuel delivered to petrol stations in the UK. Strikes are expected to take place over the Easter Holidays in order to cause maximum disruption. It is expected to cause the biggest disruption to fuel supplies since 2001. The government have responded in typical fashion by accusing drivers of putting people’s lives at risk, as Ambulances and Fire Engines would not be able to run. They have forgotten to mention that the Union have stated that emergency services would have access to fuel. “Our economy is just getting back on its feet and any action that makes that harder is totally unjustified”. How selfish of the drivers to want industry standard minimum health and safety regulations? The government has been planning for the strike action and has trained 300 scab drivers from the armed forces to take over the delivery of fuel. They have also stated that they will be using the police to prevent pickets from blocking depots or interfering with scab drivers. It’s a shame that there has not been a move to link up the strikes with a fuel price campaign, but there is time yet. I think we need to organise to support this. Are there set dates for the strikes yet? Not sure if it has been mentioned on here but Wincanton fuel drivers were on strike in Jan and Feb over pay. The latest news I can find from it is from Feb 4, the strikes were suspended for further talks. Wincanton warehouse workers in Swindon also held a 24 hour strike in response to the creation of a 2 tier workforce. The government have increased the driving hours of tankers from 9 a day, 56 hours a week, to 11 a day, 77 hours a week. I think that Unite must have agreed to this. If not, they don't look like opposing it at all. Restricting rather than increasing driving hours would have strengthened the drivers' hand in the short term. And increased driving hours can't be good news for drivers. Apart from a bit of overtime the 77 hour week driving time (like the 56 hour) means working many more hours than this. It doesn't include breaks, tipping, loading, cleaning the tanker (essential if different types of petroleum are being transported) and other safety maintenance. At no time can the driver be out of sight of the rig and one of the main complaints of the workers is the onerous and awkward working hours which destroys family life. So the pittance in overtime is nothing but the further misery of longer hours. Much has been made of the forty-odd grand pay of the drivers. This is the top rate and is bonus-related. Some shifts start at two and four in the morning. The tendency (which has been going on for 15 years under the auspices of Unite) is for sub-contracting to third-party hauliers on increasingly short-term contracts. "A race to the bottom" as one driver put it. I agree with Len McClusky though (today's Scotsman). I think that the government tried to set the drivers up for a defeat (McClusky himself uses the example of the miners). But this incompentent bunch in government doesn't, at the moment, have the intelligence of the Thatcher regime. The delegates have rejected the proposal and more talks are on. Because of ballot irregularities it doesn't look as if there will be any strike earlier than mid-May (unless there's a wildcat, which is looking increasingly unlikely). The bosses have offered nothing on pay and pensions: "aspirations" for the first and "examination" for the second, according to today's BBC. What has been agreed by the bosses and the unions - and this should come as no surprise - are equal opportunities, disciplinary procedures and trade union facilities.